Throughout most of June and well into July 1990 the question of where talks might actually be held continued to be a sticking point. 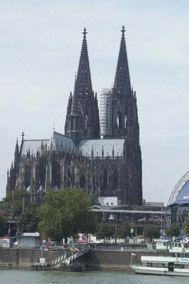 A meeting that took place in Cologne in late April was reported in the Portuguese press only as late as July; but the MNR was only present unofficially in any case. Blantyre in Malawi was mooted, but this proposal collapsed. Finally, direct talks opened in conditions of tight security in Rome, under the auspices of the Comunità di Sant’Egidio, a lay Catholic community which believed – and continues to believe – that «war is the mother of every poverty». 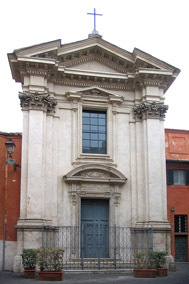 Sant’Egidio was to be the venue for the entire peace process that eventually led to the General Peace Accord of 1992, and to multi-party elections in October 1994. Above: From left to right, a view of Cologne, Germany; a street scene in Blantyre, Malawi; and the Church of Sant’Egidio in Rome, Italy. In mid-July, Nelson Mandela, then deputy president of the ANC, paid a visit to Mozambique and spoke to enthusiastic crowds at rallies, promising to do everything that he could to support the process of ending the conflict. Intensive peace effort underway – Chissano. Herald [Harare] (4 June 1990). In English. Click here to download a PDF file, size 29 kb. David Masunda. Mozambique peace talks to resume. Herald [Harare] (6 June 1990). In English. Click here to download a PDF file, size 20 kb. Mozambique: the Kenyan obstacle. Africa Confidential [London] (7 June 1990). In English. Click here to download a PDF file, size 80 kb. Maputo, Luanda in peace moves. Herald [Harare] (8 June 1990). In English. Click here to download a PDF file, size 35 kb. Peace talks. Independent [London] (8 June 1990). In English. Click here to download a PDF file, size 15 kb. The MNR has agreed to open peace talks in Malawi. Peace talks plan denied. Herald [Harare] (9 June 1990). In English. Click here to download a PDF file, size 16 kb. Washington DC-based representatives of the MNR say that they know nothing of reported plans to hold direct peace talks in Malawi. Malawi venue for talks. Herald [Harare] (11 June 1990). In English. Click here to download a PDF file, size 25 kb. Chissano again reaffirms that Malawi is the agreed venue for talks with the MNR. Mozambique peace talks start today. Herald [Harare] (12 June 1990). In English. Click here to download a PDF file, size 22 kb. Mozambique talks bring govt., Renamo closer to peace. Citizen [Johannesburg] (12 June 1990). In English. Click here to download a PDF file, size 64 kb. 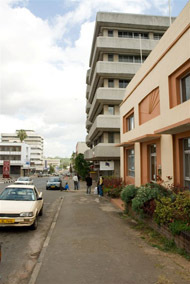 Reports that Mozambican cabinet ministers, Renamo chieftains, and representatives of the Kenyan and Zimbabwean governments had assembled in Blantyre, but had not yet actually sat down round a table together. Mozambique peace bid fails amid evidence of disagreement in rebel ranks. Southscan [London] (15 June 1990). In English. Click here to download a PDF file, size 82 kb. The talks in Blantyre never happened, even though Guebuza, Mocumbi and Dhlakama were all present in the city. According to this report, this was because of disagreements within the MNR. Chissano assures MNR bandits safety at talks. Herald [Harare] (18 June 1990). In English. Click here to download a PDF file, size 122 kb. Mozambique blames rebels for talks failure. Southscan [London] vol.5 no.24 (22 June 1990), p.179. In English. Click here to download a PDF file, size 55 kb. Mozambique oppositionists in Europe hear minister. Southscan [London] vol.5 no.24 (22 June 1990). In English. Click here to download a PDF file, size 20 kb. The group which published the «Cologne Manifesto» earlier in 1990 have met with minister Aguiar Mazula. Zimbabwe cannot effectively mediate in Mozambican conflict. Financial Gazette [supplement] [Harare] (22 June 1990). In English. Click here to download a PDF file, size 77 kb. MNR bandits urged to attend direct peace talks. Herald [Harare] (26 June 1990). In English. Click here to download a PDF file, size 56 kb. [Cologne meeting between Renamo and government representatives]. O Século [Lisbon] (2 July 1990), p.2. In English, translated from Portuguese. Click here to download a PDF file, size 503 kb. Translation into English of an article originally published in a Lisbon daily newspaper. A meeting organised in Cologne by the ACCM, an organisation of Mozambican exiles, was attended by Mozambican government representatives. An MNR member called Boaventura Lemane was also present, although he was not formally mandated by the group. Composition of the delegations. Rome, 10 July 1990. 1 page. In English. Click here to download a PDF file, size 22 kb. Joint communiqué. Rome, 10 July 1990. 2 pages. In English. Click here to download a PDF file, size 56 kb. Mozambique: secret talks in Rome. Pretoria News [Pretoria] (11 July 1990). In English. Click here to download a PDF file, size 51 kb. Mozambique in direct talks with MNR bandits in Rome. Herald [Harare] (12 July 1990). In English. Click here to download a PDF file, size 60 kb. Mozambique’s bid for peace. Argus [Cape Town] (12 July 1990), p.16. In English. Click here to download a PDF file, size 506 kb. Mozambique talks bring govt., Renamo closer to peace. Citizen [Johannesburg] (12 July 1990). In English. Click here to download a PDF file, size 2.1 Mb. Secret Mozambique talks held: hope for end to war this year. Cape Times [Cape Town] (12 July 1990). In English. Click here to download a PDF file, size 101 kb. Mozambique ministers in direct talks with MNR. Herald [Harare] (13 June 1990). In English. Click here to download a PDF file, size 64 kb. Reports that Mozambican cabinet ministers, Renamo chieftains, and representatives of the Kenyan and Zimbabwean governments had assembled in Blantyre, but had not yet actually sat down round a table together. Karl Maier. Cordial talks mask battle for power in Mozambique. Independent [London] (13 July 1990). In English. Click here to download a PDF file, size 64 kb. MNR talks welcomed. Herald [Harare] (16 July 1990). In English. Click here to download a PDF file, size 41 kb. The United States administration has welcomed the peace talks that have begun in Rome between the Mozambican government and the MNR. [Raul Domingos criticises excessive optimism]. O Século [Lisbon] (16 July 1990), p.6. In English, translated from Portuguese. Click here to download a PDF file, size 463 kb. I’ll do everything to stop Moz war, vows Mandela. Cape Times [Cape Town] (17 July 1990). In English. Click here to download a PDF file, size 497 kb. 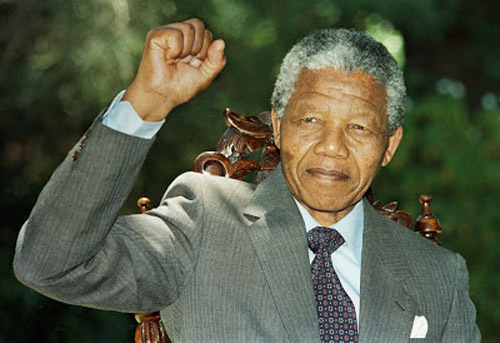 Our victory is in sight, says Mandela to Mozambicans. Daily Mail [Johannesburg] (17 July 1990). In English. Click here to download a PDF file, size 534 kb. Esmaré van der Merwe. Mandela urges end to Mozambique war. Star [Johannesburg] (17 July 1990). In English. Click here to download a PDF file, size 525 kb. Above: Nelson Mandela visited Maputo in mid-July, a few months after his release from prison, and assured Mozambicans at a rally that he would ‘do everything possible’ to bring an end to the Mozambican conflict as soon as possible. Esmaré van der Merwe. Regional peace after SA settlement – Mandela. Star [Johannesburg] (18 July 1990), p.3. In English. Click here to download a PDF file, size 74 kb. Mandela speaks in Sofala province at the end of his visit – here somewhat prematurely termed a «state visit» although Mandela at this time held no government office. João de Sousa. No fim da sua visita de quatro dias a Moçambique, Mandela enaltece coragem de Maputo visando diálogo de paz com a Renamo. Diário de Notícias [Lisbon] (19 July 1990). In Portuguese. Click here to download a PDF file, size 78 kb. This page was first posted on 17 July 2013.